If you’ve ever driven anywhere with your pooch in tow, you’ll know how able they are to weasel their way into the front. This kind of behaviour might be entertaining, but an excitable dog is the last thing you need in the cab when you’re trying to drive. According to a AAA survey, 29 percent of pet owners who drive with their animals admitted to being distracted by them. In 2009, the The National Highway Traffic Safety Administration (NHTSA) found that 20 percent of all crashes resulting in injury were triggered, at least in part, by distracted driving. Luckily, it’s not all doom and gloom – you can easily improve your focus and reduce the risk of driving for both yourself and your dog by ensuring they’re properly restrained in the car. One simple but effective solution is to install a dog car barrier. These devices are installed between the front and back seats of your car, or between the trunk and the back-seats, and make sure your canine companion stays put. There are plenty of options on the market right now, and we’ve selected the top 10. We hope that this selection, along with the handy FAQ section, will help you choose an auto pet barrier that’s right for you and your dog. Kicking off our list is Bushwhacker, with their deluxe dog barrier. 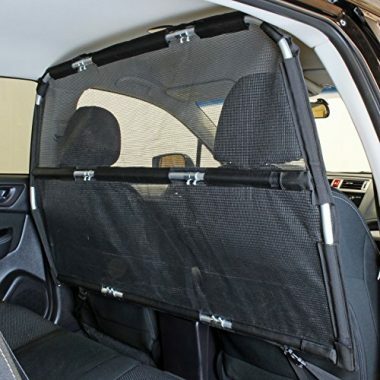 Featuring a tough, scratch-resistant mesh, the barrier keeps dogs in the back without preventing airflow around the car. The mesh is reinforced by lightweight metal tubing, which holds the device firmly in place. It can be easily attached to the car via the front seat headrests and seat belt mount or frame. 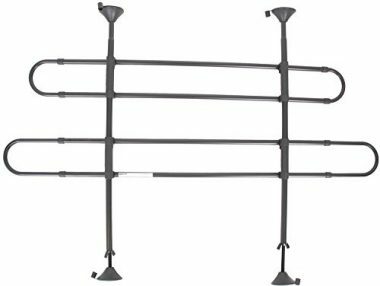 At 56 inches in length, the barrier is best suited for full-sized sedans, trucks, and large SUVs. If you’re driving something a little smaller, Bushwhacker also offer a 50 inch model. Customers agree that even the most determined canines can’t work their way through the durable mesh. 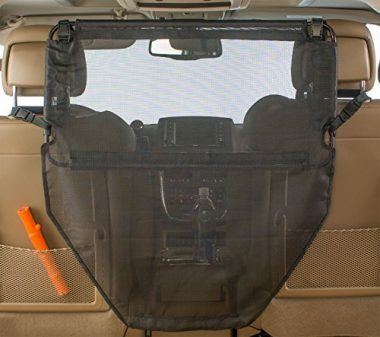 Overall, the dog car divider is a great value way to keep your pooch safely where they should be, even on the longest of journeys. The next dog guard for car to earn a spot on our list is Walky’s adjustable barrier. The headrest mounted barrier is constructed from high quality powder-coated steel, and features a telescopic design that allows it to fit virtually any car with just a little adjustment. It’s quick and easy to assemble, with no tools required, and is mounted via the front seat headrests. For smaller dogs who are liable to slip through the gaps, Walky provide an optional mesh attachment to cover the bars. The quality steel is tough enough to stand up to dogs of any size, yet lightweight so as not to weigh down your car. Users say that the barrier is easy to assemble and remove, as well as being strong and sturdy. The clever installation mechanism also spreads the weight of the bars evenly between the two front seat headrests, unlike other, spring loaded models, which put pressure on the floor and ceiling of a car and risk leaving marks. 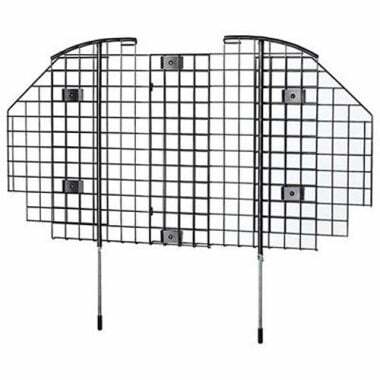 MidWest’s pet gate for cars is another product that has impressed us. It’s the first model on our list to keep dogs in the trunk area, rather than the back seats, making it ideal for owners who drive a hatchback, SUV, or van. The simple but effective wire mesh design provides a strong and stable barrier between your pet and your passengers. The mesh is finished with a black coating that acts to cut glare, improving your visibility while driving. 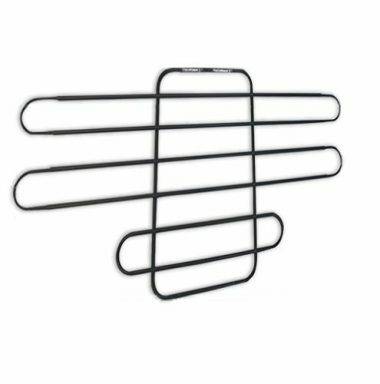 Beneath this surface, the mesh is made from durable wire, while the locking mechanism that holds the barrier in place is made from heavy duty tubular steel. The barrier can adjust its width from 31 to 70 inches, and vary its height from 31 to 50 inches, making it easy to fit into most vehicles. This flexible fit renders it easy to install and remove - simply adjust the width and height so that it becomes wedged against the roof and floor of the car. Customers report that the bars are easy to install, and keep adventurous pooches exactly where they should be. 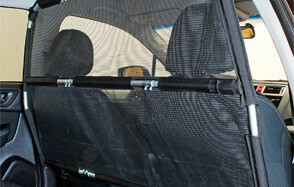 The next pet barrier for cars to earn itself a spot on our list is High Road’s compact and functional mesh frame design. The frame improves your visibility by only blocking the space between your car’s two front seats. The smaller space between the seats and the side of the car is left free, helping you see what’s going on in your rearview mirror. These spaces are too narrow for most medium and large dogs to squeeze through This extra visibility is great for your four pawed passengers, too - its clever design allows them to see the driver, for reassurance. anyway. The mesh barrier is supported by a sturdy top panel that won’t buckle or fold under the pressure of excitable paws. Around the barrier’s perimeter, a durable steel frame, coated with protective foam bumpers, provide additional stability. The whole barrier is scratch and chew resistant, and can be positioned at various heights on the seatback, by connecting to the front seat headrests with adjustable straps. Overall, it’s an easy to install, easy to assemble solution to keep excitable pooches at bay. Another dog gate for cars that has caught our attention is Petego’s. Their universal vehicle pet barrier can be easily fitted to the front seat headrests, creating a firm boundary that keeps four pawed passengers in the back. It’s constructed from high resistance square steel tubing, with solidly built adjustable clamps for attachment. Its glare-free black coating improves visibility, and helps the bars blend into the background. Despite being subtle, though, these bars are tough - able to stand up against almost any energetic pooch. The device offers all the strength of a permanent barrier, with the convenience of quick and easy uninstallation. Bear in mind that this particular barrier won’t work with Volvo cars; they don’t tend to have vertically adjustable headrests. Zoo Keeper’s dog fence for cars boasts a somewhat unusual design. The barrier works through a series of flexible cords that wrap around your car’s front seat headrests. This setup allows seats to move and recline freely without the need to remove the device. Its carefully engineered design can be fitted to almost any car, and is shaped so as to prevent your dog from squeezing through the usual gaps. Its black-coated steel frame is slim and subtle, so as not to impede your visibility. The device is easy to install, too - you won’t need any tools, and it should take a matter of minutes. Made in the USA, the device comes with a 100 percent satisfaction money back guarantee. Pets and owners alike can benefit from this easy to use and sturdy device. Solvit have made our list thanks to their sturdy and easy to use dog car barrier. Their durable design keeps energetic pets contained in the trunk, so you can focus on the road. Its adjustable setup can easily be expanded from 32 to 49 inches in height, and 33 to 57 inches in width, allowing it to fit virtually any vehicle - including crossovers and SUVs. Sections of the bars can be removed using Solvit’s unique Connect Clamps, for quick access the the cargo area without having to remove the entire device. The barrier is easily fitted by being wedged into place between your car’s floor and roof. Rubberized caps on the top and bottom of the installation bars reduce ratting as you drive, prevent slippage, and help reduce the marks that this kind of barrier can leave on your car’s upholstery. Our next pet cargo barrier is ideal for larger vehicles. Its adjustable floor to ceiling bars can be extended to a maximum of 45 inches in height, while the side bars can slide to a width of 65 inches. The padded braces on the top and bottom of the bars minimise marking to your car’s interior, and help it grip properly, and reduce noise during use. It’s easy to install behind the back seats of most cars, separating the cargo space - and any canine passengers riding back there - from you and your human occupants. The strategically placed bars ensure maximum visibility in the rear view mirror, without allowing playful pooches to squeeze through. 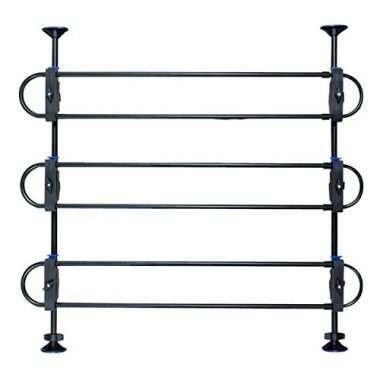 Customers say that the barrier is simple to assemble, and doesn’t budge - a great success, and all at a budget-friendly price point. The Pet Net does exactly what it says on the tin; its mesh design holds excitable canines in the back seats, and prevents them from distracting you by squeezing up front. The versatile solution can also be installed between the car’s back seats and cargo area, making it the ideal option if your pet rides in different positions regularly. The barrier is easy to install via any of the car’s headrests, making it quick and easy to manoeuvre into place. In the majority of cars, the net reaches from just above the floor to just below the ceiling in most cars. Like many of the options on the market, it doesn’t cover the space between the front seats and the doors, so be warned that especially small (and determined) dogs may be able to wriggle their way through. The net is supported by a sturdy metal framework, and can be conveniently stored in the handy bag included with every purchase. Last, but not least, is another barrier by Solvit. Their compact design features a scratch resistant micro-mesh, which also makes for easy visibility. This mesh is attached to a coiled metal frame, which pops out much like a pop-up tent, for fast installation and convenient storage. The adjustable suspension system allows the barrier to fit all vehicles with headrests, and a handy storage pouch is included. 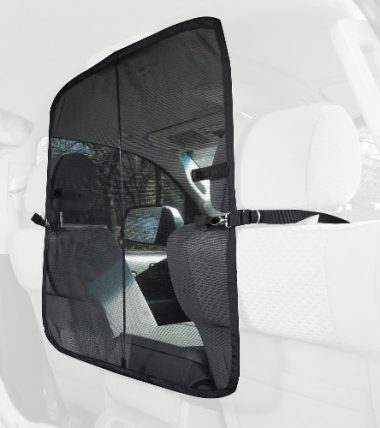 It should be noted that, like many mesh style barriers, this one leaves some room between the front seats and the car doors, so it may not be suitable for smaller pooches - particularly if they’re known escape artists. 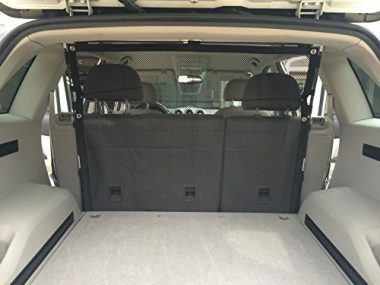 Customers report that the barrier works perfectly to keep dogs at bay, doesn’t obscure visibility, and allows car seats to be moved and adjusted without removing it - ideal for two door cars. And there you have it – these 10 barriers represent the best you and your pet can get. But which one is right for you? And how can you get the most out of these useful safety devices? We attempt to answer these questions in our handy buying guide below. 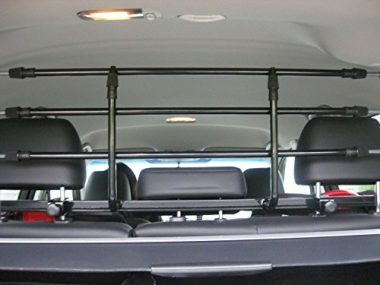 The first thing to consider when buying a dog car barrier is whether it will fit your vehicle, usually by attaching to the headrests. The majority of barriers are adjustable, at least to a certain extent, but it’s a good idea to take a measuring tape to your car before you make a final decision. Manufacturers will be able to provide sizing guidelines if in doubt. Many barriers are more suitable for medium and large dogs than their smaller counterparts. The smaller the dog, the more easily it can worm its way through any barriers. If this sounds like your pooch, we recommend choosing a mesh barrier that covers as large a surface area as possible, such as the first option on our list. 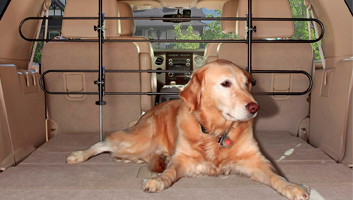 When choosing a dog car barrier, you’ll have two main options to select from: mesh, or bars. Mesh barriers tend to blend into your car’s interior more easily, offer improved visibility, and eliminate even the smallest of gaps. However, the mesh won’t be as rugged as metal bars, and you may find that larger, more powerful dogs can damage it. 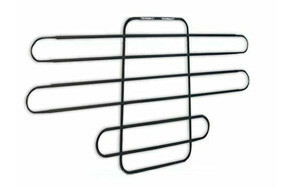 Bars, on the other hand, are more sturdy, but may leave gaps or affect rear view mirror visibility slightly. How each barrier should be installed will depend on the make and model, and you should always consult the instructions included. Via Headrests – Many dog car barriers are held in place with straps, clips, or clamps, that are attached to the headrests of either the front or back seats. Often, these barriers are also secured at additional points (such as the center console or seat belt mount) to maximise their stability. Wedged in place – Other guards are simply wedged in place – usually between the back seats and cargo space. 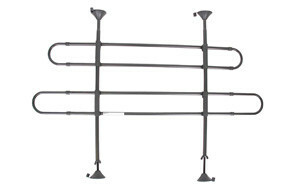 Telescopic tubing extends or retracts to fit the space you’re working with snugly. Often, rubber or plastic caps provide additional friction to prevent any slippage. Q: What is a dog car barrier? A: Dog car barriers are simple devices designed to keep dogs off of the front or back seats of your car. They consist of either a mesh frame, or series of bars or wires, and are either wedged in place or attached to anchoring points such as headrests. They keep dogs where they should be, and prevent distracted driving. These barriers can be used in isolation, or with additional safety precautions such as a dog cage for car or seat belt harness. Q: Do vehicle barriers work in any size vehicle? However, you should avoid using these barriers with soft top convertibles – the profile of these cars is often too low to accommodate these barriers. To be sure the barrier will fit your car, get out your tape measure and check the manufacturer’s recommendations. Q: Can any of these barriers be used in an RV or mobile home? A: For most RVs, no. The space between the driver’s seat and the rest of the vehicle is too large for these barriers to fill, and you’ll need to find another way to keep your dog where they should be on the move. This solution will likely be a crate or harness. However you travel with your dog, be sure to take regular breaks to keep them comfortable. Q: Will barrier leave an indent in my headliner? A: With barriers that are wedged into place between your car’s ceiling and floor, marks in the headlining are a risk. Many models are designed to minimise this effect, however, with cups or caps that spread the pressure the bars exert more evenly. If you do find irritating indentations on your hearliner, is can usually be replaced for between $180 and $200. Q: Can I use the pet barrier with a panoramic sunroof? A: In short, yes. However, you’ll need to purchase a vehicle-specific model rather than the adjustable versions on our list. This is because non-specific barriers have the potential to put undue pressure on the sunroof, and could even scratch the surface, or fail to grip properly. For us, the best dog car barrier available right now has to be Bushwhacker’s deluxe model. The barrier combines the strength of metal tubing with the aesthetics and improved visibility of mesh, providing an option that truly is the best of both worlds. It’s easy to attach to front seat headrests, making for quick and simple installation. Additional straps that can be attached to the seat belt mount or car seat frame offer extra security, so you can rest assured your pet won’t be able to squeeze through to the driver’s seat. The barrier is lightweight, simple to install and remove, and can stand up to the assaults of virtually any energetic pet. With this handy device, you’ll never have to worry about your pooch riding shotgun uninvited again.